who was father serra'S GUIDE AND INTERPRETER. "THIS ADVENTURE STORY RINGS TRUE," writes Patrick McCloskey O.F.M., in his St Anthony's Messenger review of the 1985 edition of OLD FATHER'S LONG JOURNEY. "Karney's talents shine when Juan describes how [his people--the Achastans of Carmel] viewed the coming of the Spanish soldiers and missionaries, and how life was never the same again." JUAN EVANGELISTA JOSÉ was the historically true Native American youth who served as FATHER SERRA'S interpreter and guide and who accompanied him on the dangerous journey from Monterey to Mexico City. Once there, neither the King's man nor Serra would bend, until finally Serra's humility broke the impasse and the order was signed freeing the Missions from military authority and assuring their continuation. It is through Juan's eyes we view Serra's coming, the establishment of the first missions, and the Long Journey. The statue to the left is by contemporary San Miguel Mission artist, Leonard Potter. Click on the image to see a full, enlarged version of the statue and to learn more about the artist, his work, and how to obtain a reproduction of this statue . Among Beulah Karney’s previous books her Listening One received the Child Study Association’s "Award of Merit for Race Relations," commending its portrayal of Native Americans. In Old Father’s Long Journey the story is told with a similar sensitivity towards California’s First Peoples, and in a way that highlights the reverence for all creation that was the bond between Serra and the tribal peoples who honored him with the name "Old Father." Marianne Elliott was born in Oakland, California. A graduate of the University of California at Santa Barbara, she is presently completing her PHD in Forestry at the University of Washington. Her illustrations reflect her love for the plants, animals and First Peoples of her native state. Moreover, she is descended from a Spanish soldier―José Ygnacio Rodriguez― who, under the Captain Rivera Y Moncada of this story, came to California and settled near the Santa Barbara Mission where he is buried. The 2001 edition has been revised and edited by the author's daughter, Ann K Elliott, with special attention to language preferences of native peoples, to fourth grade vocabulary, and with additional supplementary teaching materials. Old Father is written in the classic tradition of a story for all ages, yet with a simplicity children Fourth Grade and older can read, comprehend and enjoy. Younger and older ages alike, as well as those who enjoy reading aloud to them, will appreciate in the book’s lyrical prose and easy flow. View the back pages of OLD FATHER’S LONG JOURNEY on line. Here you will find a number of supplemental materials for California Mission Studies, including a Map of Tribal Lands and Missions, a glossary, Spanish pronunciation guide, and an extensive bibliography of books and articles on Serra and the Missions. 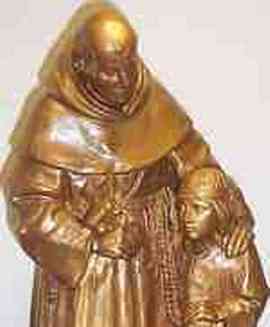 Lending further authenticity to the true-to-life story of Serra and his young interpreter is the front piece illustration of the statue of Junípero Serra and the Achastan youth of this story which stands today in the garden of the San Fernando Mission. TO READ ON-LINE CHAPTERS Go to CONTENTS page. 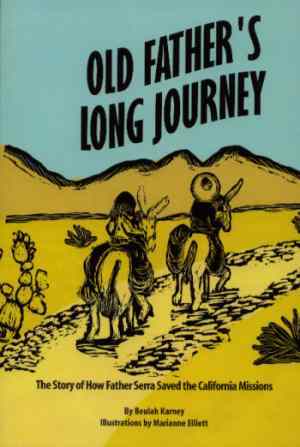 OLD FATHER’S LONG JOURNEY, © 2001, 6" by 9" quality paperback, 237 pages, 16 black and white illustrations, plus above-described educational supplements. Available from www.amazon.com $16.95, or to download a FREE PDF copy of entire book see above.